Nassau, Bahamas, has a very special place in BVI track and field history. It was there in 1976 the first team of four athletes participated in the Carifta Games. It was there in 1978, the first medal was won, silver in the 400m. It was also there that the first gold medals were won in 1992 in the Long and Triple Jumps and yet again, Nassau is where the most medals were mined, when the territory’s athletes bagged a record eight, in 2013. 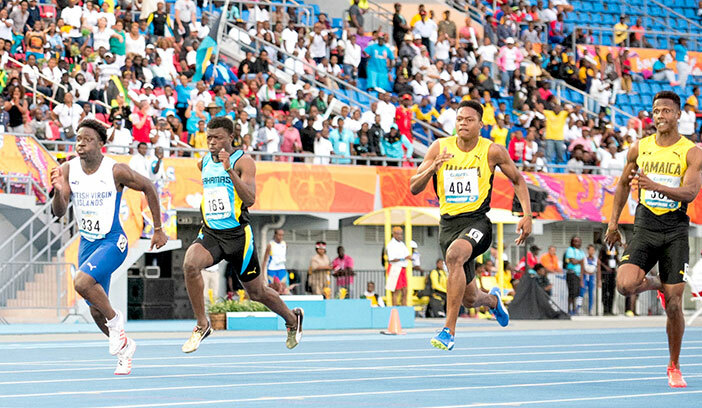 So, it was fitting, that in 2018, in the territory’s 43rd year of competing, during the 47th annual Carifta Games in Nassau, Rikkoi Brathwaite won the territory’s 50th medal and in the process, became the first U20 Boys 100m medalist, when he earned bronze in 10.46 seconds, after becoming the first U20 Boys finalist last year. As a bonus for his stellar effort, he qualified for the July 10-15, IAAF World Jr. Championships in Tampere, Finland. Ironically, although the territory’s focus has long been on sprinting, there have only been three athletes in 43 years to reach a Carifta Games sprint final—Derwin Scatliffe, U17 Boys in 1987, Bratwaithe, U18 Boys in 2016, U20 Boys in 2017, again this year and in Nassau, Jaleel Croal became an U17 Boys 100m finalist—the second in that division. Bratwaithe who ran 10.92 seconds in the 100m in the 2016 Elmore Stoutt Inter-House Championships, has been a finalist in all of his three Carifta Games. Brathwaite, who joined Keita Cline, a 1990 U17 Boys 200m bronze, as the only short sprint medalists, advanced to the 200m final with a personal best time of 21.40 seconds, to take down J’Maal Alexander’s six-year old Jr. National Record of 21.62 seconds. He followed up with 21.41, for seventh in the final. Meanwhile, after using a 47.95 seconds personal best to advance to the U20 Boys 400-meters, Joshua Hill settled for eight place in the final, in the second best performance of his career, 48.40 seconds. His 47.95 puts him at No 10 on the All Time List. Josh, as he’s know, was fourth in his 200m heat after recording a personal best time of 21.85 seconds, but did not advance. 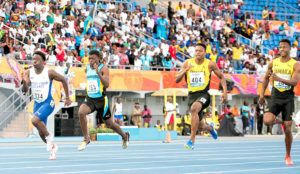 In field events where the BVI has harvested 56% or 28 of its 50 medals in individual events, (63% if 6 relay medals are omitted), Djimon Gumbs narrowly missed adding to the tally and had to settle for fourth place in the U20 Boys discus throw, after Barbados’ Triston Gibbons surpassed his 53.24m (174’8”) effort with a heave of 53.31m (184’10¾”) on his final attempt. Gumbs won U18 Boys silver last year. Twin brother Diamante, had a best effort of 43.29-meters (143’0¼”) to finish tenth, but was slightly injured in the process and pulled out of Monday’s shot put. Djimon, who also won U18 shot put silver last year, fouled out of the U20 Boys event, in his division debut. Seeking her first Carifta Games medal after a narrow fourth place as an U18 Girls athlete in 2014, Beyonce DeFreitas—who won Commonwealth Youth Games 200m silver in Nassau last summer—did not advance after finishing sixth in her U20 Girls 100-meters heat in 11.89 seconds, in a race that had a 3.3 mps tailwind. An injury knocked her out of Sunday’s 200m prelims. A silver medalist in U20 Girls javelin throw a year ago, Akira Phillip was seventh in the event with a best mark of 39.30-meters (128’11¼”). Arianna Hayde was seventh in the U20 Girls long jump with a leap of 5.64-meters (18’6”), after earning an U18 Girls javelin throw bronze medalist a year ago. Akrisa Eristhee finished eight in the U17 Girls 400m with a time of 57.67 seconds, after advancing to the final with a personal best of 55.74—a time that puts her at No 10 on the BVI All Time List. She finished third in her 200m heat in a non-advancing run of 25.30 seconds. Zara Brown did not advance in the U17 Girls 100m, after placing fifth in her heat in 12.30 seconds, in a race that had a 3.2 mps tailwind. She placed fourth in her 200m section in 25.39, but did not advance. Displaying her versatility, Xiomara “Gia” Malone, recorded a long jump personal best leap of 5.29m (17’4¼”) to finish eight in the U17 Girls division, after leaping 1.60m (5’3”), in her first event to finish seventh in the high jump. She ended her sujourn with a sixth place finish in the 100-meters hurdles, with a time of 14.50 seconds, improving on her 15.11 time from last year. On the boy’s side, Croal was sixth in the U17 Boys 100m final in 11.05 seconds—joining Derwin Scatliffe from 31 years ago, as the only finalists in this division. He advanced after running 11.02 seconds with a +2.4 meters per second tailwind, placing third in his heat. Malik John produced a 51.96 seconds 400m personal best for sixth in his heat. In the 200m, he ran 23.42 seconds and placed fifth in his section, but wasn’t a finalist in either event.